Six modules are taught on the SPHeRE Programme in Population Health and Health Services Research. All modules are available in a blended learning format – with a combination of interactive online teaching and face-to-face teaching – allowing for more flexible delivery. Teaching takes please each Wednesday (11am-5pm) and occasionally on Thursdays (9am-2pm) from October to April annually. Modules are taught in the Royal College of Surgeons in Ireland (RCSI), Trinity College Dublin (TCD) and University College Cork (UCC). Each module is assessed through a written assignment and/or presentation. This information is also available as a printable PDF booklet for download below. 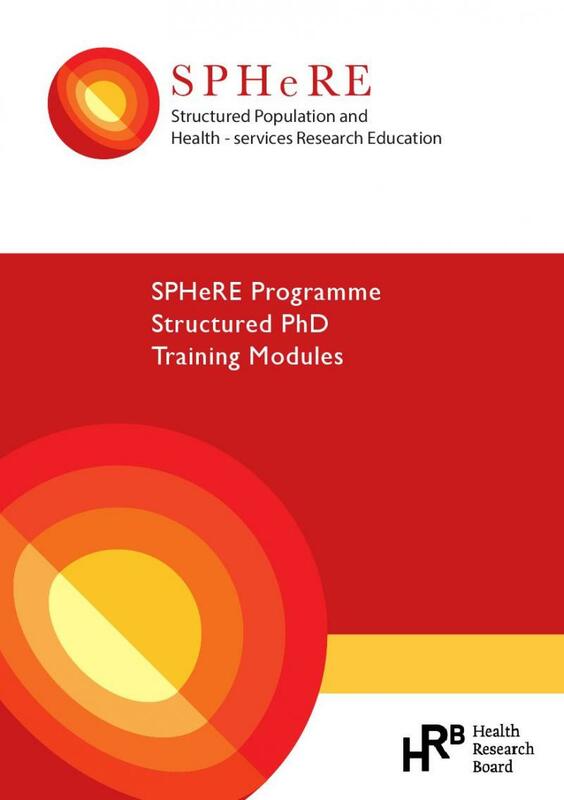 SPHeRE modules are also available to individuals outside the SPHeRE PhD Programme. The cost is €1000 for one module or €5000 for all six modules. This introductory module prepares scholars to describe and discuss the major determinants of health and disease in the population and assess the impact of health services on the health of our population. On completion scholars are able to describe the burden of disease at national and global levels, discuss and distinguish between biological, behavioural and environmental factors in the aetiology of the major diseases and appraise the role of health promotion and implementation science. As a ‘scene setter’, this module creates sufficient context to enable scholars to appraise core population health and health system problems and typical responses to such challenges. This approach contextualises the remaining modules of the taught course helping scholars to understand the multidisciplinary nature of the field and develop a critical PHHSR perspective. Different cases and core topics are used to frame disciplinary perspectives. This pedagogical strategy enables scholars to make critical links between the general context of population health and healthcare challenges in Ireland, and the ways in which population health and health services research can provide critical insights into policy and practice issues in the Irish health system that corresponds to those challenges. This module prepares scholars to describe, discuss, and compare the range of research methods relevant to PHHSR. On completion of the module scholars are expected to demonstrate specific core skills in both quantitative and qualitative methods. From the quantitative perspective, scholars are introduced to key epidemiological terms and the characteristics of good research design; they learn valid techniques for the measurement of health and disease and develop study design skills including understanding inference in PHHSR. Data collection methods introduced include questionnaires, surveys and sampling. A review of routine data sources is also made. From the qualitative perspective, scholars develop understanding of the different research paradigms and study designs for qualitative research. They critically appraise typical qualitative data collection and analysis methods including in-depth interviews, focus groups and observational methods. Scholars are introduced to thematic analysis and the reporting of findings, interpretations and conclusions. They develop research skills with experiential learning projects that take them through the key stages of qualitative research practice from literature survey to research strategy to data collection, analysis and discussion; these include doing a preliminary literature review, an interview, an exercise in participative enquiry and preliminary data analysis. On completion of this module scholars are able to describe and critique the structure, operation and performance of the Irish healthcare system and to contextualize it with reference to other health systems worldwide. They become familiar with the conceptual frameworks from the health policy analysis literature and understand their application in an Irish context. As the approach of this module is interactive and discursive, scholars discuss and appraise the main policy debates relating to human resources motivation, migration and workforce planning as well as focusing on the public/private mix of Irish healthcare, the decentralisation of services and universal health care. As a third feature of this module, scholars are introduced to the approaches, structures, issues and practice of healthcare management and healthcare management research within the Irish context. The module is a comprehensive introduction to the functionality of the healthcare context in Ireland – its systems, processes and organizational dynamics. In this module scholars describe the major sources of research evidence (including the grey literature), conduct effective and efficient searches of the literature to the level required for a Cochrane Review and critically appraise, summarise and synthesise the literature on a specific topic. They define a health service problem, identify a related research question or questions, discuss and select from appropriate study designs and methods and write a detailed research protocol addressing key planning: clarifying the research question; collection, management and analysis of data; ethics considerations in research; and standardised reporting of research. The experiential approach to learning enables scholars to develop the skills necessary for presenting a successful PhD proposal. The approach of this module is to progressively enable scholars to understand and make the links between the practice and logic of statistics, the analysis of statistical data, and the issues relating to the use of health information and core datasets; these include data quality, accessibility and usability. On completion of this module scholars are able to access and use routine health and health service data applying basic epidemiological and statistical methods. They also describe, discuss and appraise the performance and options for health information systems nationally and internationally. In this module scholars are exposed to the uses of economics and econometrics in the analysis and evaluation of health care. The module provides a basis for more advanced study for those likely to use economics in their PhD research. Scholars are introduced to the key principles, concepts and approaches of economic theory before they appraise health systems from the perspective of economics. Key issues such as health financing, equity and resource allocation are discussed, as are the practical methods of economic evaluation.